Lacrimal passage diseases are one of the most widespread among eye diseases. Lacrimal passage disorders registered in all age groups. Such disorders found 8 times more in women than men patients. Such patients consist 10% of the total number of ophthalmological branch patients according to our records. R.Kuran researches show that there are 6-25% of such patients (2-7.5% among these numbers suffer from chronic dacryocystitis). Because of its frequent involvement into pathological processes, detailed information on anatomic-topographic features of lacrimal passages must be provided. Dacryocystitis accompanied by lacrimation causes a lot of uneasiness and lowers working capacity of the patients, especially if it involves accurate and scrupulous job performance (doctors, aviators, assembling fitters). Dacryocystoradiography is a standard diagnostic technique in such pathology. This method allows evaluating both lacrimonasal passages condition and obliteration progression, though soft tissues and facial osseous structures summation does not provide exact localization of the process. It also does not provide affinity estimation with nose accessory sinuses. Condition estimation of normal and pathologically changed lacrimal passages based on available and effective hardware diagnostics methods remains problem number one at present. Nowadays potential of NLS and also CT (computer tomography) research methods is not used at its maximum and it is not implemented in medical treatment standards. Therefore the implementation of hardware diagnostics high-tech methods is a must to fulfil adequate and effective lacrimal passages diseases diagnostics. 28 patients with various lacrimal passages disorders (age from 18 to 80; 18 women and 10 men) were examined. After ophthalmological examination all patients underwent radiology procedure. Using «Metatron-4025» (IPP) fourth-grade system (generator frequency 4.9 GHz and «Metapathia Hospital» professional software) all patients underwent NLS-ultramicroscanning examination. 25 patients underwent multi-layer spiral CT using Brilliance64 (Philips) system with contrast enhancement by non-ionic iodine-containing medication (Omnipak 240 mgI/ml) in sinus volume scanning mode. Contrast enhancement was performed after prewashing of lacrimal passages via lacrimal openings by physiological solution. Thickness of tomographic slice – 0.38 mm. Multiplanar reconstructions in coronary, axial and sagittal sections were modelled. As a result of conducted researches using 3D NLS the following was achieved: dacryocystitis was registered in 9 patients, estimation of intubation material of lacrimal ducts was performed in 2 patients; neoplasm of lacrimal sac found in 1 patient. Chronic dacryocystitis was found in 8 patients, post-traumatic dacryocystitis in 2 patients, obliteration of lacrimal ducts in 2 patients and neoplasm of lacrimal sac found in 1 patient as a result of multi-layer spiral CT with contrast enhancement. Chronic dacryocystitis was accompanied by lacrimal sac affection during 3D NLS. Contents of lacrimal sac: moderately chromogenic liquid – found in 4 patients; hyperchromogenic parietal formations (characterized by purulent contents) found in 10 patients. Hyperchromogenic parietal homogeneous sharp-contour formations (inflammatory clots probably) were found in lacrimal sacs of 4 patients. Vascular bed in lacrimal sac view was not changed based on NLS-microangioscanning data. After using of multispiral computer tomography with contrast enchancement, chronic dacryocystitis was characterized by lacrimal sac enlargement on average up to 15.0 × 10.0 × 10.0 mm., with even sharp contours, homogeneous contents; canaliculi were enlarged up to 10.0 mm., sharp-contoured. Luminal narrowing of nasolacrimal duct was registered in 4 patients; complete lumen obliteration was registered in 4 other patients. Narrowing in distal part of nasolacrimal duct was registered as the most often factor. Thus pathology of accessory sinuses of nose was diagnosed in 7 patients. Pic. 1. Chronic dacryocystitis, multispiral computed tomogram with contrast enhancement. Estimation of installation correctness of intubation material in lacrimal ducts was performed after surgical measures on lacrimal ducts. 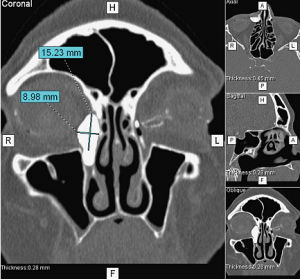 Chronic post-traumatic dacryocystitis was diagnosed in 2 patients after using multi-layer spiral CT with contrast enchancement. Acute ectasia (15.5 × 7.6 mm) of lacrimal sacs on both sides with sharp and straight contours was registered. In both cases nasolacrimal ducts did not visualize due to osseous structures injury of nasolacrimal ducts. Lacrimal ducts obliteration was diagnosed using multi-layer spiral CT with contrast enchancement. Patency blockade of lacrimal ducts with no contrast substance in subjacent parts of lacrimal passages was registered. Moderate widening of lacrimal ducts lumen up to 1.1 mm. with sharp and straight contours was also found. In case of such pathology, it is preferable to perform NLS after surgical intervention and placement of silicone capillary tube. Pic. 2. 3D NLS-graphy. Chronic dacryocystitis. NLS examination detected new growth of lacrimal sac. Medium chromogenic formation (heterogeneous, with irregular indistinct contours) was visualized in lacrimal sac view. Multi-layer spiral CT with contrast enchancement was performed to estimate consistency, affinity to neighboring parts and process prevalence. Lacrimal sac widening up to 10.0 × 6.0 × 9.08 mm. was registered. Central filling defect with irregular indistinct contours (6.74 × 3.04 × 7.29 mm.) was found in lacrimal sac. Filling defect density was 61.0 N units. 3D NLS with ultramicroscanning is high-efficiency method in lacrimal passages diagnostics and it allows diagnosing lacrimal duct and lacrimal sac pathologies. Multi-layer spiral CT with contrast enhancement is an informative method in lacrimal passages diagnostics and it gives the opportunity to determine exact process localization, its intensity, patency of lacrimal passages, relation with adjoining structures and its affinity for accessory sinuses of the nose. As can be seen from the above, 3D NLS must be considered as 1st stage method in diagnostics of lacrimal passages diseases. In addition, multi-layer spiral CT with contrast enhancement must be considered as correction method and 1st stage method in case of nasolacrimal canal pathology. 1. 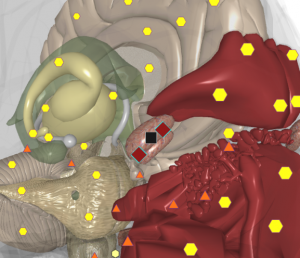 L’yu R. Anatomico-physiological features of lacrimal gland according to modern 3D NLS diagnostic techniques. 2013. 2. Kurana R. Endonasal microendoscopic surgery in treatment of chronic dacryocystitis. 2009. 3. Nesterov V.I. «3D NLS diagnostics. Development prospects»// Collection of scientific works of Insitute of Practical Psychophysics «NLS-technologies in medicine– development prospects ». Vol. III. M.: Book, 2010, pages 5-8.